East meets South of the Border! A friend asked me to whip up some appetizers for a boat cruise we planned to take over the Labor Day weekend. 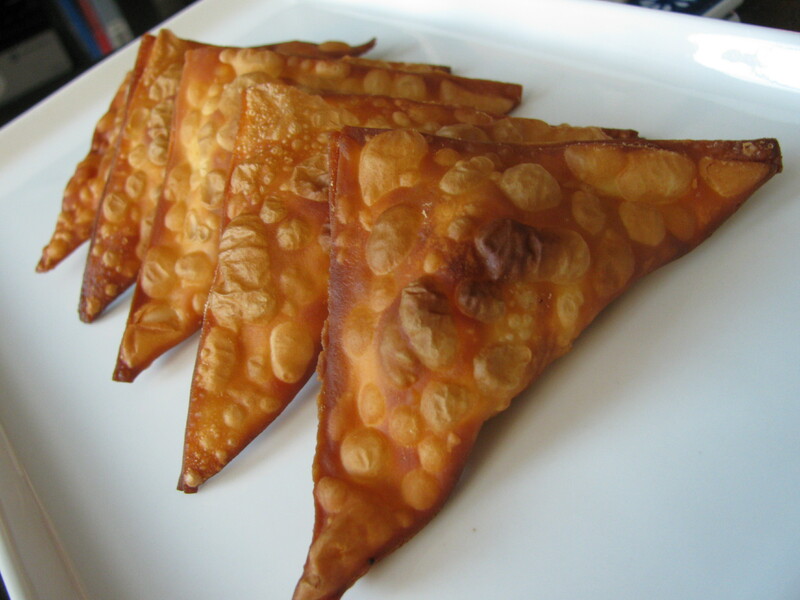 My sweetie came up with the idea of chorizo and potato and after a few drafts we came up with a recipe for wontons with a Mexican twist. Tragically, the boating company cancelled the cruise but thanks to my buddy Scott and his rooftop deck, the party went on. These little guys pack loads of flavor into perfect little party sized bites and were a real hit. Ole and Namaste! Pour some water in a small dish or container. Set aside. Cut the potato into small dice. Chop the green onions thinly using only the greens. Place the chorizo and potato into the dry, preheated skillet. Stir the mixture as it cooks, breaking up the chorizo and coating the potatoes. Cook until the potato is tender. This takes about 10 minutes. Allow the chorizo and potato mixture to cool. 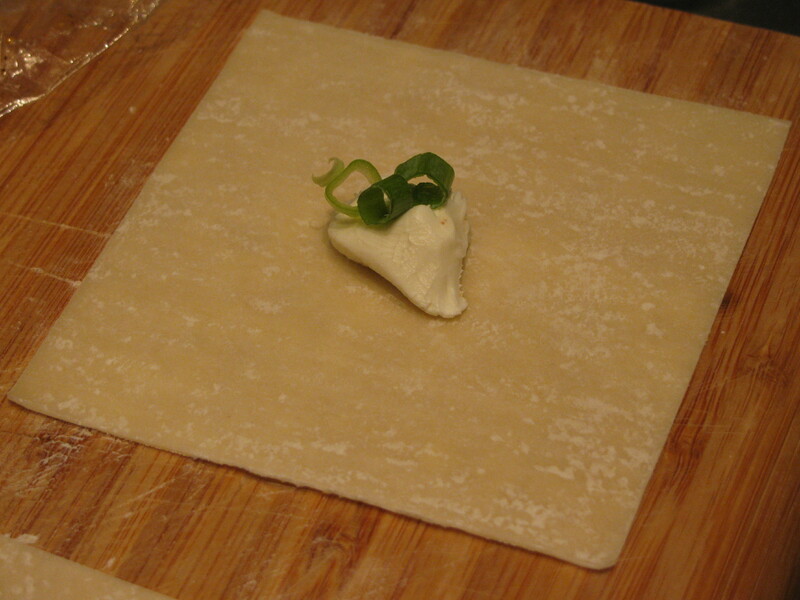 Place a wonton wrapper on a cutting board. In the center, place ¼ tsp of cream cheese, a few slices of the green onion and ½ tsp of the chorizo and potato mixture. 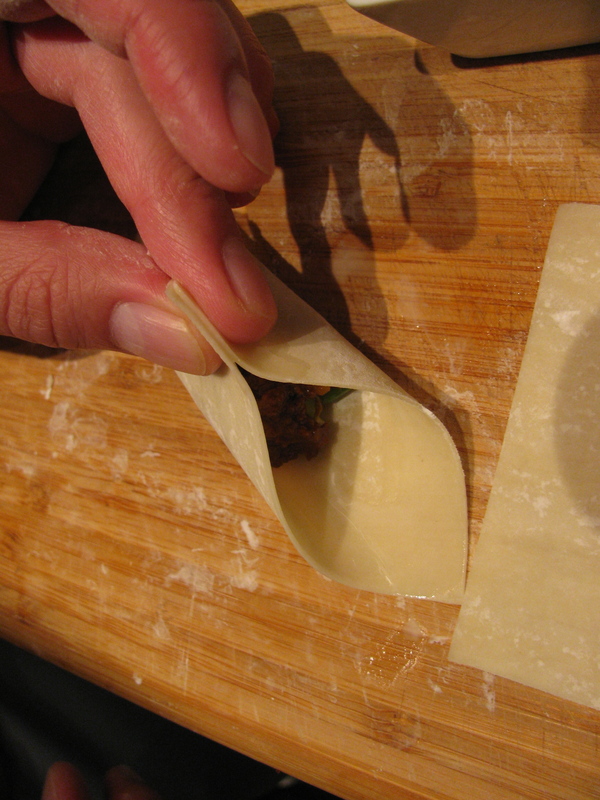 Dip your finger in the water and moisten the edges of the wonton wrapper. 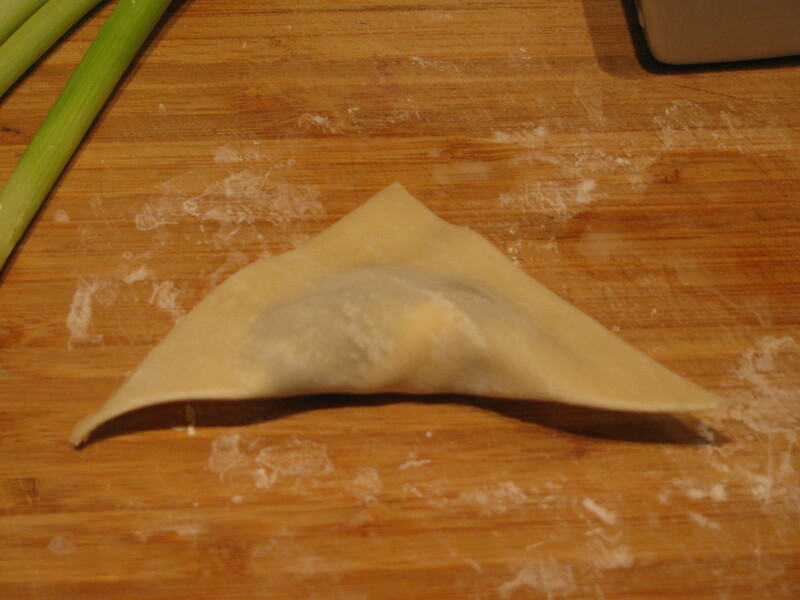 Fold up the wonton and press the two opposite ends together forming a triangle. Press the ends together. 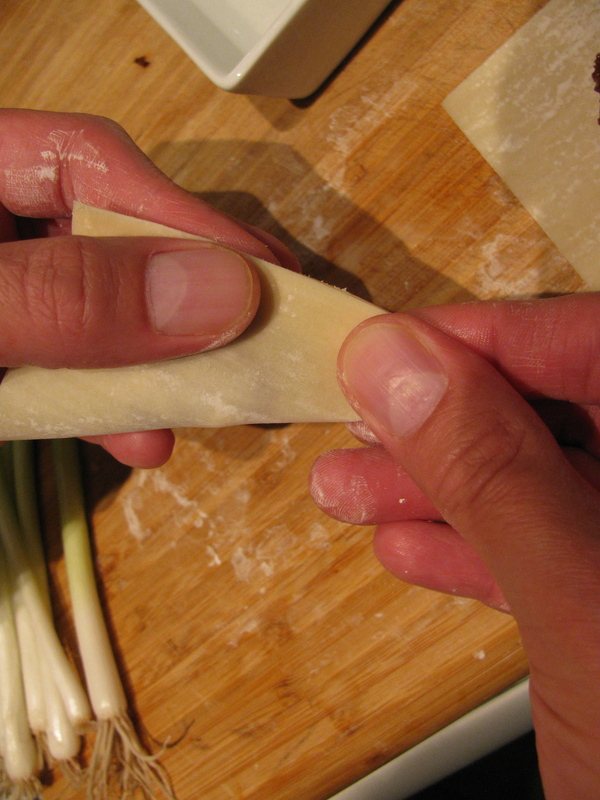 Seal one end of the wonton by pressing the edges together until shut. Repeat on the other side. 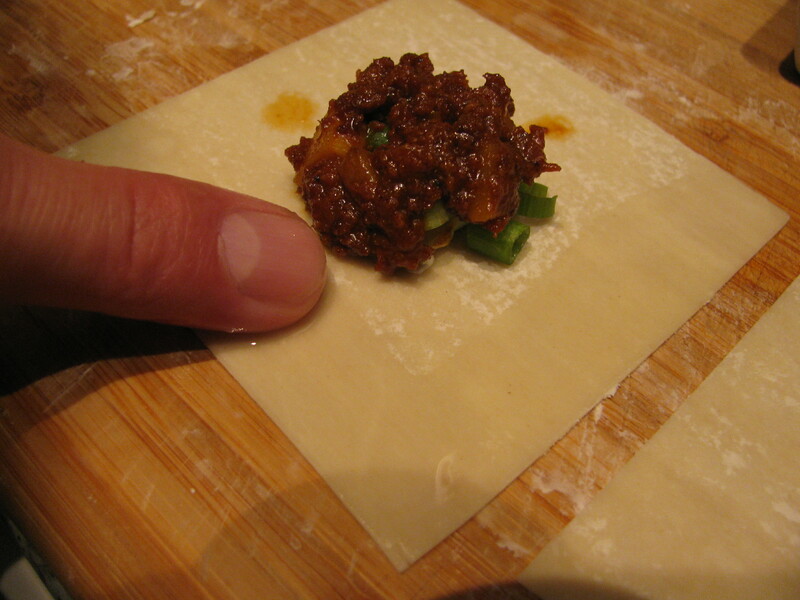 Place the finished wonton on a baking sheet or plate. Repeat with remaining wontons. Add enough oil to the heated skillet so that you have about ½ inch of oil in the pan. 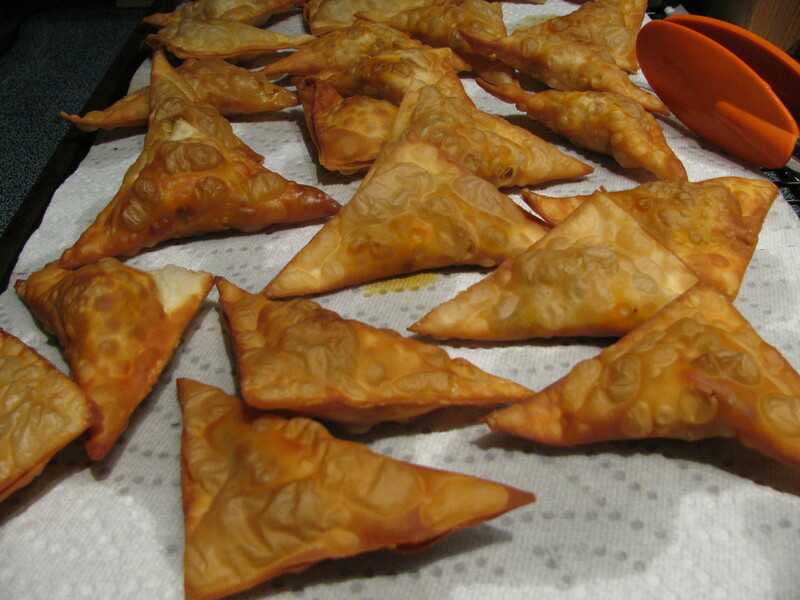 Heat the oil then add the wontons in batches and fry until golden brown and crisp; about 2 minutes per side. Using tongs or a spider, remove and drain on paper towels. Serve hot with and with a dipping sauce on the side! Try teriyaki sauce, duck sauce, sriracha, Mexican hot sauce, salsa or even a honey barbeque. A great Mexican beer or margarita is the perfect drink to pair with this appetizer. Change it up! Don’t like chorizo? Try sweet or spicy Italian sausage or any other type of sausage instead. For my Veggie pals, you can find ‘Soyrizo’ in most groceries stores and it works beautifully!